Year 1 begin their theme unit on ‘Pets,’ with a visit from a vet nurse! Dog Sarge gets a cuddle! Thank you so much Mr de Graaf, Nurse Nikky and Sarge for coming to visit us yesterday last Thurday. We learnt how important it is to care for our pets: to love and play with them, to train them and to make sure they are well fed, watered and kept clean and brushed. 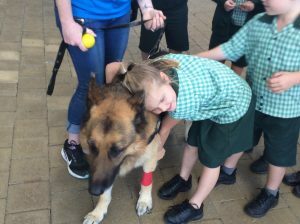 We learnt about all the wonderful things vets do to look after our pets too. Our favourite part was watching Sarge do his clever tricks and having pats and cuddles too.